Solomon Lodge No. 10 in Ft. Calhoun celebrated 150 years with an event on July 20, 2016 at the Blair Marina in Blair Nebraska. The event was well attended by members of the Lodge as well as great representation by the Gr0and Lodge officers. The lodge members were pleased to have Most Worshipful Grand Master Dennis Rix and his wife Nan in attendance. Solomon Lodge was granted dispensation on August 24, 1865 and the Charter was granted at the Grand Lodge communication on June 22, 1866. Grand Master Dennis Rix speaks at the celebration. Most Worshipful Phil Lorenzen, Secretary of Solomon Lodge, shares memories of the history of Solomon Lodge at the 150th anniversary celebration. Bob Schapp, Worshipful Master of Shiloh Lodge No. 327 presents the Sonny Eatmon Traveling Gavel to Worshipful Master Bradley Larsen of Solomon Lodge. The DeMolay Conclave was held at Midland University in Fremont July 15-17, 2016. Pictured below is 2016-17 DeMolay State Master Councilor Dakota Wells being installed by 2015-16 Master Councilor David Strang; and the Grand Master’s Lady Nan Rix brings greetings from the Grand Master. The Grand Master was unable to attend due to an out of state conference. ​DGM Rick Myers and PGM John Maxell visit with MW Tommie Blan, Grand Master of Prince Hall Grand Lodge of Nebraska, at their Annual Communication on July 15, 2o16. The Masonic-Eastern Star Home for Children in Fremont held a ground breaking ceremony on July 13, 2016 at the future site of the new Paden Cottage. 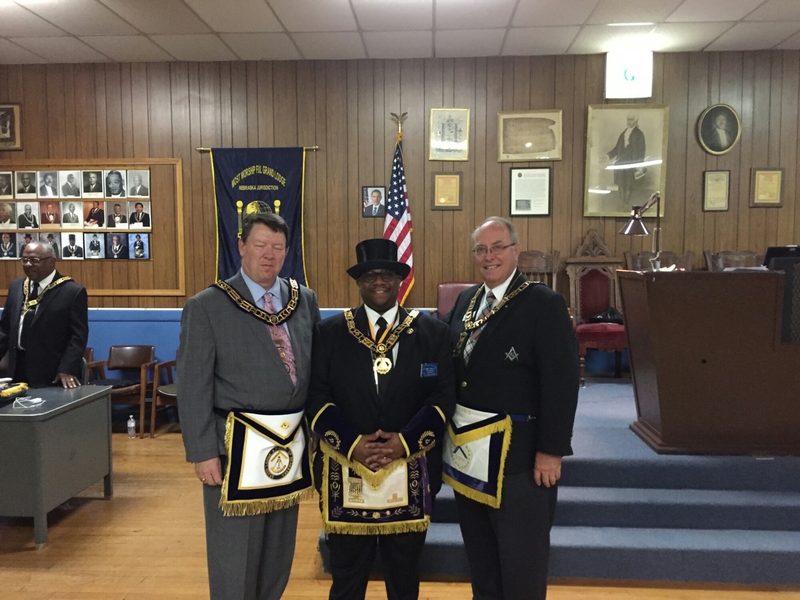 Deputy Grand Master Rick Myers visited Plainview Lodge No. 204 as they celebrated their 125th anniversary on July 9, 2016. Brothers and ladies of Plainview Lodge No. 204 enjoyed a day in the sun on July 9th. The event was organized by Senior Warden Bruce Curtis. The participants, including DGM Rick Myers, saw a lot of beautiful scenery and had a lot of fun on the Niobrara River. Former Governor of Nebraska G. Charles Thone was presented with the Bronze Jordan Medal from Lincoln Lodge No. 19 on July 6, 2016 at his home in Lincoln. The medal was presented by Kent Folsom, Worshipful Master of Lincoln Lodge No. 19, and Deputy Grand Master Rick Myers. Brother Thone was raised in May of 1953. Former Governor Thone served in the US Army as an Infantry NCO and officer during World War II. He attended the University of Nebraska, earning his law degree in 1950. He was elected as Congressman for the 1st District in 1971 and served in that capacity until 1979 when he was elected as the 34th Governor of the State of Nebraska, serving from 1979 to 1983. Grand Master Dennis Rix is pictured with Imperial Potentate Jerry Gantt. Grand Master Dennis Rix with Ron Nielsen, Potentate of Tehama Shrine.